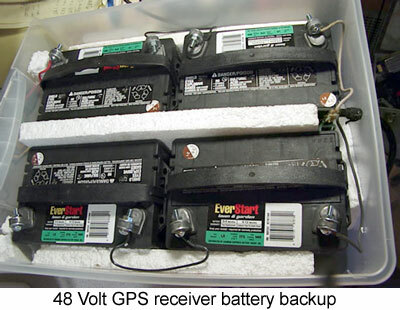 This article by Richard Bailey describes a low cost and practical method of getting a battery backup power supply for your GPS receiver. Many of the components are available from a Wal-Mart store! While marine deep discharge batteries are more suitable for very long power-off times, the less expensive automotive types shown here are usable for shorter periods where the battery is not deeply discharged. The relatively light load of a GPS Z3801A receiver helps in this regard. I decided to build a battery back-up for the Z3801A. I wanted to have a system with at least 24-hour capacity that was relatively inexpensive with readily available parts. What I came up with cost about $70 and all the parts were bought at Walmart. First of all I should say I'm not a fan of gel-cell batteries most often used for back-up and I have had very poor luck with them. A 12 volt 20AH gel-cell cost about $30 plus shipping and you'd need four of them to power the Z3801A. 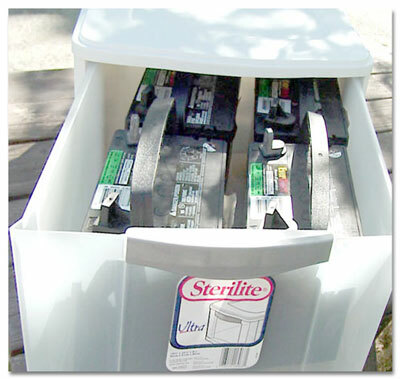 Walmart has 12 volt Garden tractor sealed lead acid batteries for $15 each (may have $5/battery refundable old battery fee-great if you have old batteries to dispose of) and four of those will fit in to a Sterlite plastic container with a drawer that will hold and protect the batteries. I bought an inline fuse holder and 3 amp 2 pin auto fuses in the automotive section and ¼"-20 1" long screws, flat washers, and nuts in hardware, and supplied my own wire. I had the wire going to the Z3801A come out the back and put the fuse holder in the recessed pull area on the front for accessibility. I used 1" solid foam for spacing but cardboard or just nothing will work. This sits underneath my bench out of the way and the wire to the receiver feeds up along the wall to the shelf the receiver lives on. All this is powered by a supply like the simple one shown on this web site with just a transformer, bridge, large filter capacitor, and two fuses. I found that I had a 120 to 39 volt 1.5 amp transformer that would "float" the batteries at 54VDC or about 13.5VDC per battery which is just about perfect. With the extra load from charging I used a 2A fuse for the load and a 1.5A slow blow line fuse. I also used a higher rated bridge rectifier. If you try to use the 36V 1.5 amp transformer specified, check what the voltage to the receiver is without batteries. If it is about 50 VDC after the receiver has been on long enough to warm up you will want to adjust it by wiring half the secondary of a 6.3 VCT 1.5A filament transformer in series adding to get the correct value or just find another transformer. Note that the output voltage will be less while the batteries are charging or after a power outage. 50 VDC is the voltage I measured after 24 hours on batteries and it may take 48 hours (about twice the outage time) to get back to 54 VDC. If power outages in your area are rare this should be adequate. A better way is to use a switching regulated supply adjusted to 54 VDC. Be warned that some power supplies are intolerant of voltage being fed into the output terminals when they are not powered and having the batteries connected directly across their output could cause severe damage to the supply. The simple unregulated supply shown on this site is not affected this way. If you plan to use another supply, connect a 10A - 100 PRV diode between the batteries and the power supply with the cathode end toward the batteries. Sometimes called a "disconnect" diode, it will be forward biased when the supply is charging the batteries, and reversed biased when the supply goes off, thus protecting the supply. The supply voltage will have to be set about .6 VDC higher (54.6 VDC) to compensate for the series diode drop.